The existing Identity and Access Management (IAM) set up at the client was based on a de-centralized model. This posed many challenges to coordinating access control across several infrastructure platforms and applications. Requesting and assigning access provisioning was a time-consuming process involving multiple people to research the required access and utilize multiple request channels to gain access. The lack of a centralized model translated to higher costs as unnecessary time and effort were required to Request, Manage, Reconcile and Certify required access. This affected core job functions that depended on timely access. The existing legacy Identity and Access Management solution was at the end of its lifecycle and support as the vendor had recently been acquired. The client needed to improve their security posture while ensuring that identities were effectively managed and access was provided as authorized in an easily traceable and efficient manner. 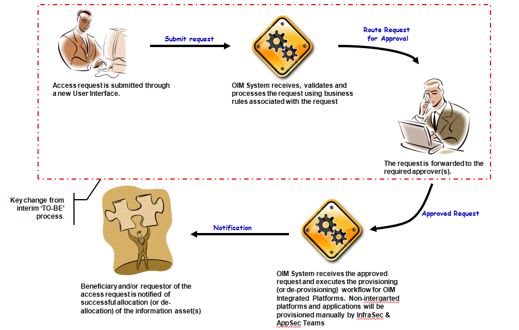 The client decided to utilize Oracle Identity Manager as it provided a best in class provisioning engine, the built-in ability to connect to various target systems, and could be tailored to match processes unique to client. Unissant offered a team with expertise in Oracle Identity Manager and defining requirements and designing access provisioning solutions. Unissant’s team analyzed the current environment, evaluated and mapped existing processes and determined ways to optimize workflows, ensuring as little disruption to existing processes in doing so. One project mandate was to ensure that was backwards compatible. The solution needed to ensure that no existing core Identity functionality was lost. Unissant’s team gathered data from the existing environment, evaluated features, limitation, and options of the Oracle product in relation to the existing and future state of the solution. The team devised workflows and end to end provisioning models for various platforms and applications leveraging out-of-the-box functionality. The team also ensured that stakeholders and auditors were aligned with the proposed solution. This was accomplished by iteratively presenting and reviewing the proposed solution. 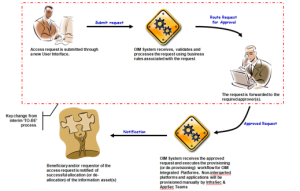 The resulting provisioning process is depicted below. Single point access request system reduced end user overhead by 90% and improved service levels across the board for all access provisioning and de-provisioning by 70%. Provisioning Oracle Identity Manager to the target platforms eliminate human errors and improved SLAs. This included reduction of processing time from 3 business days to milliseconds. Achieved reduced overhead for monthly reconciliation and audit activities as 80 hours of work was reduce to minutes. Migration from an end of life-cycle product to a best in class product ensured continued product support.